‘Sculpture and works of art’, J. Paul Getty Museum Journal volume 18 (1990), pp. 196, 197. Albert Jansz. Vinckenbrinck (1605-1664) is the most important wood carver in Holland in the seventeenth century. Apart from his monumental works such as the pulpit in the Nieuwe Kerk in Amsterdam, he also manufactured small sculptural works, predominantly in palmwood. Knowledge about his life and activities have been collected in the last 130 years. When Daniël Franken wrote a still relevant article about Vinckenbrinck in the fifth volume of the magazine Oud Holland in 1887, he only knew one work: the pulpit in the Nieuwe Kerk in Amsterdam. Nonetheless, his article formed the basis of further attributions to this sculptor. In his article Franken published the inventory that was drawn up in 1665 upon Albert Jansz. Vinckenbrinck’s death. 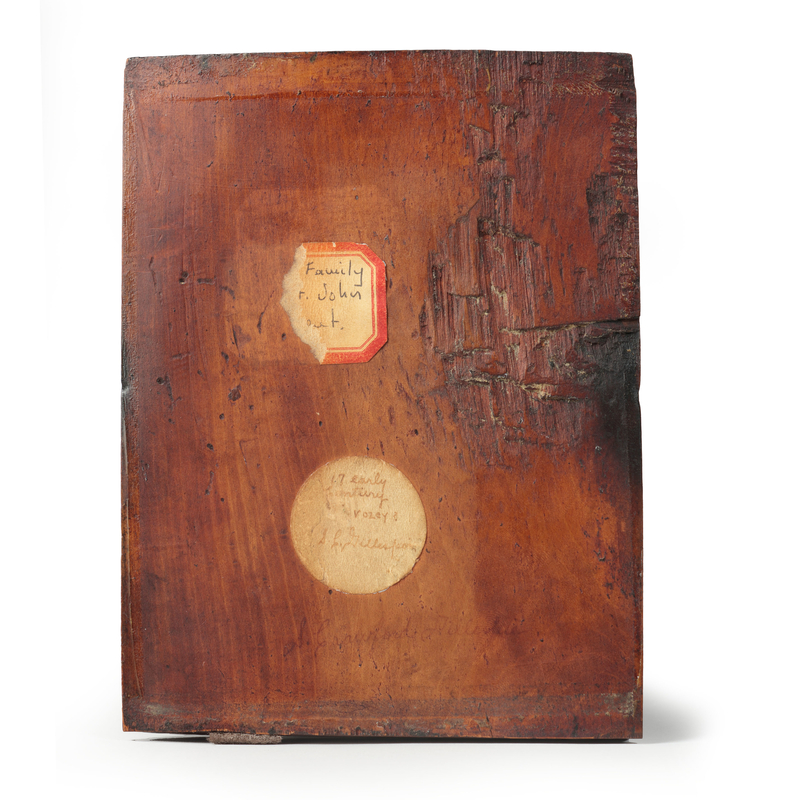 From this inventory and the 18th-century auction catalogues enclosing descriptions of the work by Vinckenbrinck may be concluded that he mostly made small sculptures. 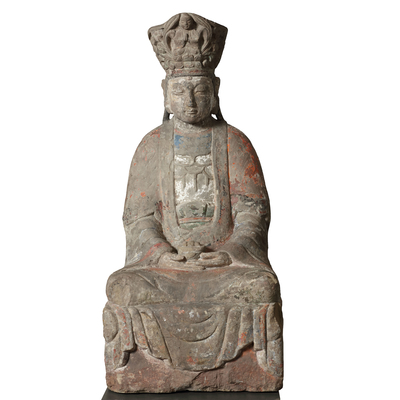 In the course of 130 years many of these sculptures have surfaced. Several of those are signed with the .AL.VB. monogram with a joined A and L as well as a joined V and B. Willy Halsema Kubes published a list of 14 small sculptures made by Vinckenbrinck in the Bulletin of the Rijksmuseum in 1991. With the exception of one sculpture, these are all signed with the monogram ALVB. Subsequently more research on the life, apprenticeship and the place of birth of Vinckenbrinck has been published in the monthly magazine Amstelodamum. Because of the fact that the exact years of his life have been unknown for a long time, his date and place of birth are still unclear. The most recent publication on Vinckenbrinck is rarely consulted and much information from old lexicons is repeated. Therefore, the fact that Vinckenbrinck was baptized on 3 April 1605 in the Nieuwe Kerk is hardly published. At the time his father lived on the Zeedijk and was a coffin maker by profession. Albert Jansz. married Geertruit Diercks from Utrecht in 1626. From the fact that he married a woman from Utrecht may be deduced that he spent his apprenticeship, or parts of it, in that city. 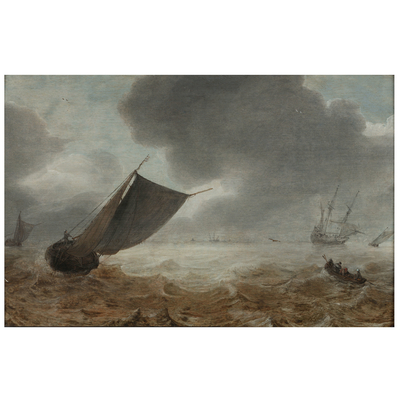 However, in his research on the various workshops of Vinckenbrinck, Bas Dudok van Heel concluded that Vinckenbrinck probably shared a workshop with his father, before becoming a near neighbor of the Amsterdam mayor Joan Huydecoper. Dudok van Heel aptly concluded that Vinckenbrinck probably made doors, door-frames and other architectural elements and that he created the small sculptures for his own pleasure, mostly because most of those small sculptures were in his own possession upon his death. The current carving of the holy family is, despite the lack of the often very small and hidden monogram, most certainly made by Vinckenbrinck.The material, the manner of carving and the similarities in the details between this plaque and the monogrammed plaques in for example the Rijksmuseum support this assumption. Especially the balding head of Joseph is strikingly similar to the carving of Job on the Dung Heap in the Rijksmuseum, as well as the detailed manner in which the tree and the ground are carved. The subject of the holy family is often depicted by Vinckenbrink. The composition is more or less consistent: a figure or a group of figures is seated beneath a tree. 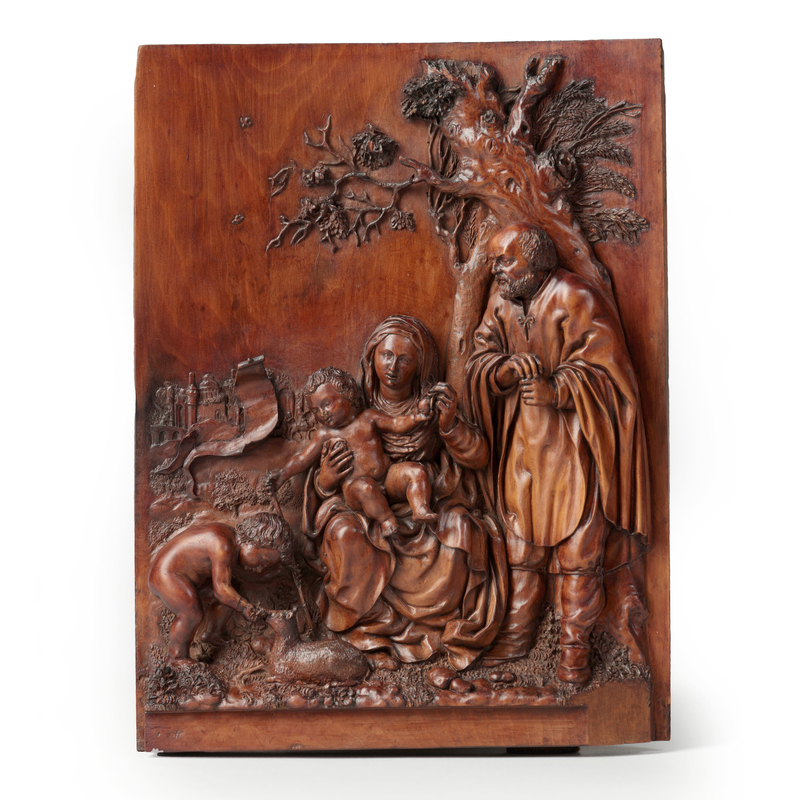 Possibly the composition of this Holy Family is similar to the carving of the Rest on the Flight into Egypt- a carving that is listed in the inventory that was drawn up after Vinckenbrinck’s death in 1665. However, as this is a recurring subject, we cannot be certain about this. The border at the lower part of the carving is cut short, while the sides have more space. This suggests that the panel was framed in an art cabinet, possibly with other panels that may have been signed, therefore adding the monogram to this panel may have been unnecessary. This hypothesis may be supported by the ‘Augsburg’ art cabinet in the J. Paul Getty Museum that is mounted with three signed reliefs by Vinckenbrinck. According to the museum the cabinet was manufactured around 1630-1640 in Augsburg. When the museum bought the cabinet from the French art dealer Kugel, the panels had not yet been attributed to Vinckenbrinck. Kugel did not know this master. The attribution of these panels to Vinckenbrinck by Willy Halsema-Kubes raises the question whether the attribution to Augsburg is correct. Of course it may be possible that Vinckenbrinck was already such a popular and celebrated artist during his life that his work was mounted in a cabinet far away from his home country in Augsburg. However, it may also be plausible that this cabinet was not made in Augsburg at all but was manufactured completely by Vinckenbrink after an Augsburg example. 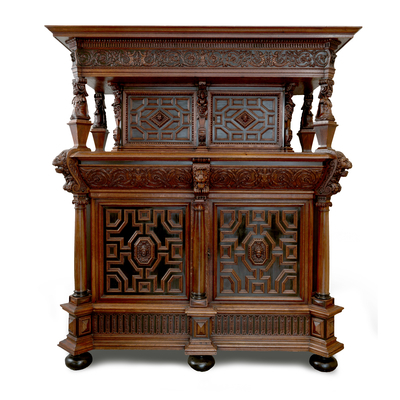 In any case, this cabinet shows the way in which these panels were used in the seventeenth century. The old labels to the reverse of the panel and the inscription give reason to assume that the panel has been hidden in an English collection for years, even centuries. There are English inscriptions on the labels and they are inscribed with the family name Crawford. Despite research, this provenance has not been proven yet.